Mosaic Monday, what a wonderful time to share garden blooms with other gardeners. This time, I am not sharing what I have blooming in my own garden, but what is blooming at a Dahlia Farm near me. We made a great Fall Nature Trip the other day, and what a lovely place it was too. It was very hot, so we got an early start. Still, we got zapped by the heat. Here are some of the blooms that we saw out of many. All of the top row of this mosaic are pictures of dahlias that we bought. We will get them next April. The first one is called “Gabrielle Marie“. We got it because of the name, which is very similar to that of a friend. The bloom is really pretty too. We purchased this one. We also bought another one that is larger, more intense in color called “October Sky“, but I realize that I didn’t get a picture of it. The white dahlia with the yellow center is called “Platinum Blonde“. We got this as a bonus tuber for meeting a minimum order. It was on our pick list anyway. “Peaches And Dreams” is the name of the peachy dahlia with the yellow center. This was also one of our purchases. Next comes “Worton Blue Streak“, which is about one of the bluest dahlias I have seen. I looked at this one at the Seattle Home And Garden Show last March, because I was looking for a blue dahlia. I got a different one that turned out to be a really deep purple and really pretty. The beginning of the second row shows the dahlia fields themselves. Such a beautiful vista. Too bad it was getting so hot, we would like to have gone all the way around the fields. The next gorgeous orange and red streaked one is called “Poppers“. No wonder. It really popped. I have really become fond of the dahlias with the unusual centers. This one is called “Dad’s Favorite“. I purchased one very similar also at the Seattle Home And Garden Show, but with a slightly smaller center and a petals that were a deeper pink. “Tahoma Moonshot” was a cute dark red dahlia with curled petals. They were covered with bumble bees. I got this shot one one on the flower. Not sure of the name of this one. I didn’t write it down, but I think it was “Juanita“. It had spidery petals that were a watermelon red. Really pretty. This pink beauty with darker pink striations is called “Maki“. This is one of the dinnerplate dahlias, and it was huge. This dark pink one with the light pink center is called “Bumble Rumble“. You can see why. They were covered with bumble bees, and I got a picture of this one with two bumble bees on the flower. 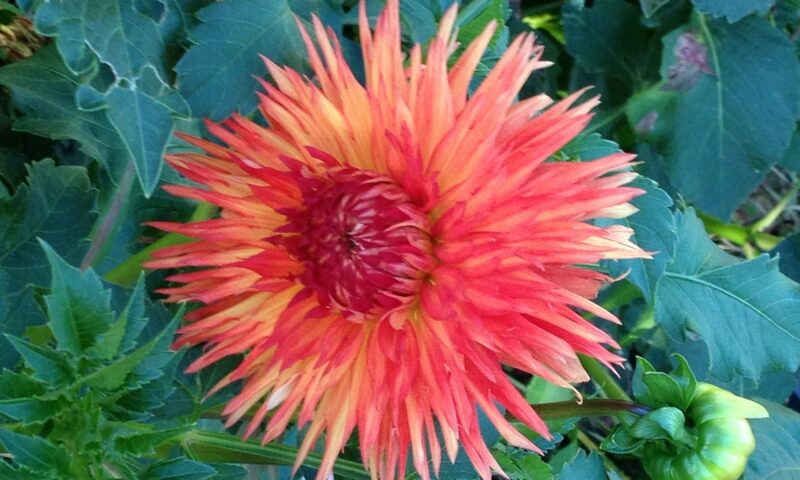 And last, but not least is this brilliant red dahlia with white petals in the center. This stunner is called “Heartthrob“. No wonder, that color certainly sets the heart racing. We now have satisfied our ever expanding plant fetish and purchased more dahlias to grow next summer. I wish we could have bought all of these and then some, but not enough room in our garden. Too bad. We really loved our Fall Nature Trip to a Dahlia Farm despite the heat. And I am really happy to be posting these pics for Mosaic Monday. There are even more beautiful flowers on the weekly garden tour at Dear Little Red House. I think Dahlias are gorgeous. I can’t grow them here … too humid and too hot. So I really enjoyed seeing your mosaic. What a wonderful place to visit! Thanks. The same to you. My only regret in this excursion to the dahlia farm is that I didn’t order Double Trouble which I had put on my watch list. I will try to add this to my order. Oh my, then I will Ned to find room for them next spring. Thank you. It really was wonderful. I love dahlias and they had quite a display. Thank you for hostessing the Mosaic Monday. It is really nice to get to see everyone elses gardens. Thanks for coming by. Yes, indeed the dahlia farm was wonderful. We bought several, but forgot to order Double Trouble. We have corrected that oversight. Looking forward to getting the tubers in spring.